I am Selena Kyle — named after the sleek and stylish Catwoman herself! 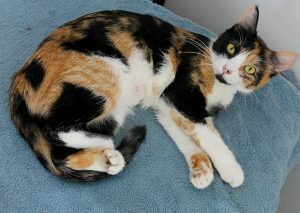 I am a gorgeous and petite little calico lady cat that is about 1 & 1/2 years old. 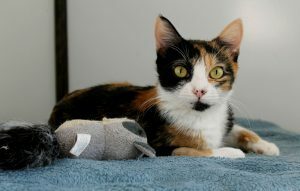 I was a young mom and came into Pixie with a litter of kittens, but I’ve since been spayed and am ready to start my own life with my new family! I’ve been pretty mellow since I’ve been here, and I like to take long cat naps in the sunshine — I’m probably catching up on all the sleep I lost while raising my kittens! That being said, when I’m not evading Batman and causing mischief in the streets of Gotham, I’m still a young kitty and really enjoy my playtime. I’m living peacefully around other cats in the Pixie cattery but I don’t seem to be a huge fan, so I may be happiest as an only cat but can probably adapt in the right home. I do seem to enjoy people big and small, and I’m definitely ready to leave my life in the alley and settle down in my forever home. Won’t you come say hello? I come to you fixed, vaccinated, and micro-chipped for an adoption fee of $100.